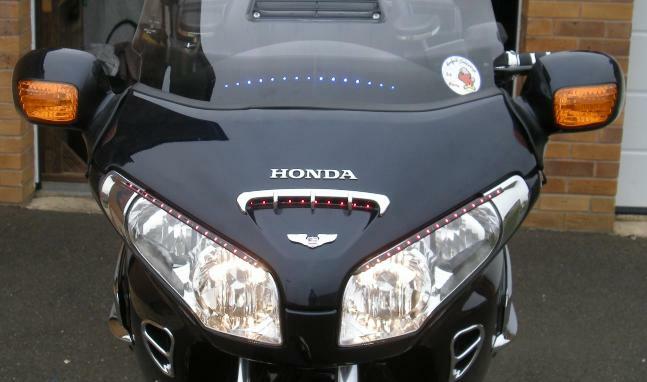 An article about adding lighting embellishments to our HONDA Goldwing GL1800. 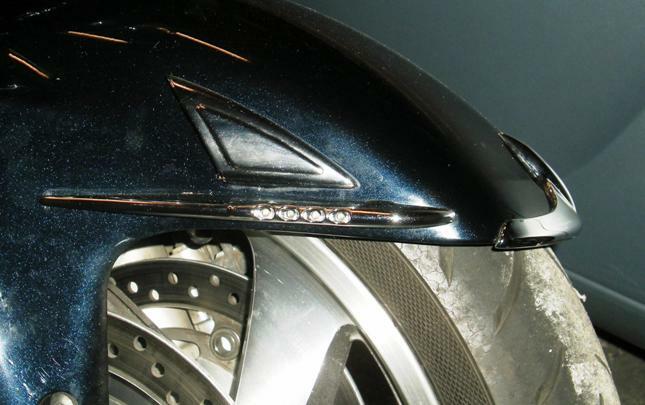 Kuryakyn - Front Fender Shark's Teeth and LED Accents. 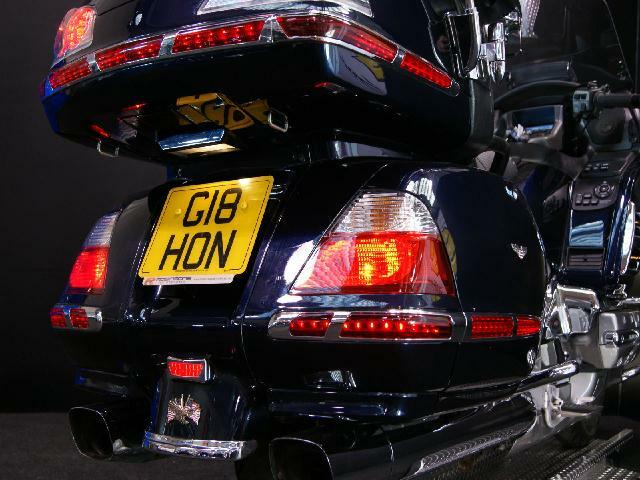 Big Bike - Side Fairing Accents, Luggage and Trunk Moulding LED Light Sets. Dealing with the Side Fairing and Luggage first, I ordered spare LED strips from www.cruisercustomizing.com. The parts cost only $23 and $26 respectively but the shipping cost another $37. So it was worth buying a nice set of Kuryakyn ISO Hand Grips to justify the shipping cost. When the parts arrived, the first thing I had to do was to peel off the side fairing Accent, which is simply stuck on with trim tape. However, you need to take care that you don't break the Accent whilst applying pressure to pull off from the adhesive. I found the best method was to get a finger under an edge and apply steady pressure whilst pulling at edges around the same area. Once it starts moving, pick another section and work the re in the same way until the whole panel is loosened and then you can pull the panel clear. However, note that the wires for the LEDs are fed through holes drilled in the fairing so take care to ease the wiring out to give you clearance to work. If you can't get sufficient clearance then its time to open up the fairing by removing the side strip and releasing the securing bolts down the edge of the fairing. Once inside, I found that the wires had been soldered together, so a pair of wire cutters make a quick solution to the problem (MAKE SURE that the ignition is not switched on when you cut the wires else you will blow your lighting fuse). Replacement of the LED strip involves removing the tiny screws and brackets which hold the strip in place, then remove the top plastic cover, turn the Accent over and, using a blunt tool, just ease the LEDs back into the panel until the strip comes loose. Turn back o ver and you can extract the strip. You then need to separate the strip from the rubber weather seal and take care not to break it as you need to re-use it on the new strip. Reassembly is the reverse of the process but you will need to clean up the adhesive still stuck to the panel and the fairing (use White Spirit to remove the sticky bits) and then reseat the Accent using new adhesive tape. The LED wires had to be fed back into the fairing through the drilled holes and then re-connect using soldered joints and insulate with tape. However, to avoid future problems of detaching the Fairing or the Accent, you can re-connect using an electrical chocolate block. Having now replaced the faulty LED strip, I had a chance to examine how it works. The LEDS are arranged in sections of 5 so that if one LED fails, it will cause all 5 in that section to go out. Now that I have a spare strip, in future I shall look to replace any individual faulty LEDs rather than the whole new strip. Repair of the Luggage Molding LEDs was much simpler as the whole system is attached by screws inside the luggage compartment and on the ends of the rear lighting strip. Once you have the mouldings removed, the LED strips unplug and just need to be peeled off from their own self-adhesive backing. Connect the new LED strip, remove the plastic backing to expose the adhesive backing and secure the strip in place making sure that you position the gaps in the strip with the screw-holes in the luggage compartment. Then refit the mouldings in the reverse order making sure you do not over tighten the screws. The Front Fender LEDs posed a different problem. I could have simply replaced the LED Accents but at $68 I thought I would try a repair first. Remove the Front Fender and release the LED wiring back to the plugs situated under the steering headstock so that the fender can be fully removed. At this point I found the reason that the LEDs on both sides had failed. The Accents are fitted to the fender by drilling 2 holes for the fixing bolts and another elongated hole to allow the wiring and plug to pass through to the inside of the fender. This elongated hole was open to the elements and it was obvious that water had entered through the hole (thrown up by the front tyre) and had shorted out the wiring which lies exposed at the back of the Accent. Removing the Accents was made difficult because shorting had caused current to pass through the metal of the Accent, into the securing bolts and then through the wet insides of the fender to find an earth path back to the battery through the bike frame. This electrical action had caused the Accent to corrode around the fixing bolts, which had caused the chrome to bubble and break away. I contacted Kuryakyn about this dreadful environmental sealing and the long term effects of its failure but they simply offered to pass my suggestion to their Quality Department. 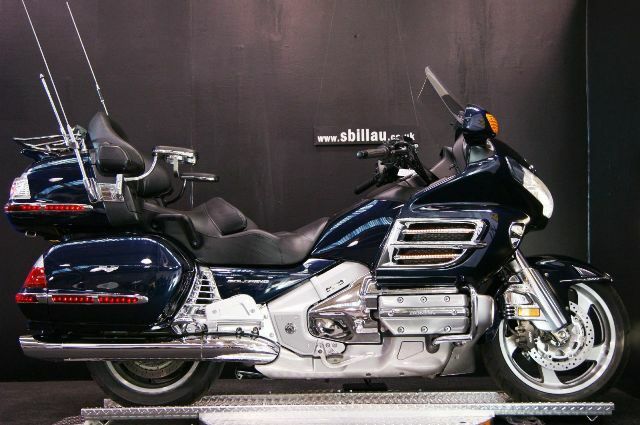 Frankly, this is extremely poor design for what is advertised as a high quality addition to the Goldwing. The Accents had been fitted to my bike in Nov 2012, so this corruption had occurred in only 1 year. The simple solution to this problem is to ensure that the wiring hole is sealed with a weather proof sealant when the Accents are attached. If this is done straight away, there should be no further problem with shorting and corrosion. Once the Accents are removed, the LED units can be eased out of the Accent body and then the plastic outer container must be prised open to allow access to the LED strip and the soldered joins. After I re-attached the wiring, re-assembled the Accents to the fender and re-connected the wiring plugs, everything worked fine. Just remember to make sure that wiring connections must be protected from weather using silicone sealant and also use insulation tape to protect the plugs under the steering headstock. Having fixed the current problems, I then looked at how I could improve the looks for Light Parades without having lots of gaudy bits hanging off the bike. First, I needed a switch unit to control the lights. These can be purchased from www.wingstuff.com at $69 plus shipping. I was fortunate to find one on EBay for much less, but if you are buying a number of items, it is probably worth getting a new one to start with. 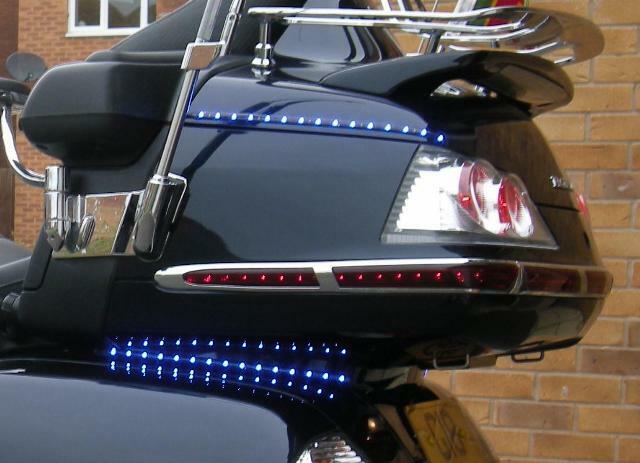 The other option is to create your own switch unit by adding waterproof switches to one of the Goldwing panels, however this does involve putting extra holes in your shiny bike !! Installing the Ancillary switch unit is straight-forward. Simply remove the Front Brake Reservoir cover by removing the 2 securing bolts. During this operation, its best to turn the handle bars so that the reservoir is level so as to prevent any oil leakage from the reservoir. Place the Ancillary Switch unit in place of the cover, then secure the cover to the top of the unit using longer bolts, which you can get from any hardware store. The unit wiring can be run down the handlebar conduit by removing the 2 screws of the conduit cover, squeeze the wiring into the channel making sure you leave the screw locations clear, then replace the cover. Loop the wiring around with the other cabling and then feed it in under the front fairing cowl to the fairing compartment. At this point you need access to the fairing compartment so remove the fairing side strip, remove the screws and then remove the panels. The ancillary unit comes with spade connectors attached to the output wires but I opted to change this for a 4 pin plug (1 live input and 3 switched outputs). The live input wire can be spliced from the lighting system so that power is controlled from the ignition switch. Next to LED lighting strips. You can purchase Kuryakyn strips but these can add up to a small fortune at the prices they like to charge. Instead I found strips on E-Bay at a fraction of the price. The strips are 30cm long and come with around 30cm of wire. I added Dupont connectors to the wires so that each unit can be disconnected. The strips have their own self-adhesive backing so you just need to decide where you want to fit them, peel off the backing and apply a small amount of pressure to fix the strip. However, to guard against shorting and corrosion, first ensure that the strip connections are sealed up using a silicone sealant. At the front of the bike, I removed the front fairing by folding the wing mirrors back and then undo the securing bolt at the top of the screen lock mechanism on each side. Lift the fairing away from the 4 securing grommets and the whole assembly comes away. You can now remove the screen to give access to the cockpit cowling. I placed an LED strip across the cowling and routed the wires down behind the screen and out through the right hand wing mirror assembly area. I also applied one across the front vent screen (a black plastic cover fitted inside the fairing and behind the vent) and one to each headlight. I then placed a strip on the lower front fairing and routed the wiring up into the front fairing area. A single cable routed from the ancillary switch plug to the front of the bike (routed via the right wing mirror assembly) was split into 4 Dupont plugs to allow connection of the 4 front strips. A further cable routed inside the front cowl allowed strips down the side of each fairing to be connected. 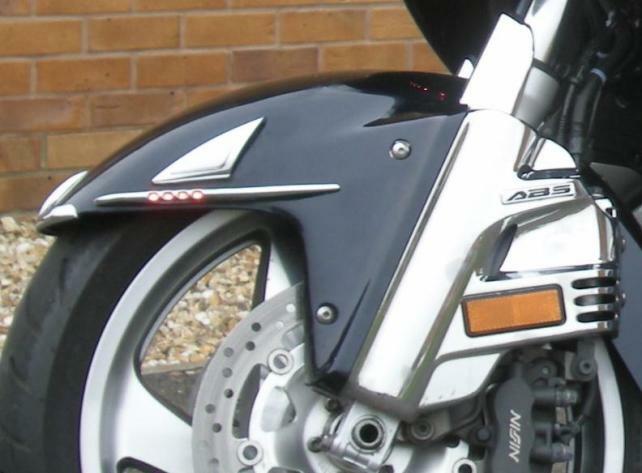 A further cable was routed inside the front fairing, and tank fairing to the back of the bike to a chocolate block connector, under the saddle, that allows strips to be attached at the sides of the boot lid and below the luggage compartment. The use of connection blocks allows further LED strips to be added without having to rewire the whole system each time. To top off the proper light parade effect, I also purchased a 5 metre LED strip that can be added to the bike using its self adhesive backing. However, I decided to fix it in place using strips of velcro - so that it can be removed when not being used. This strip, costing only £8.50 has a remote control unit that allows the rider to select different colours and patterns as you go along. I also found some nice LED illuminators that fit on the air valve of your wheels. The LEDs light up as soon as the wheel starts to move and they leave an impressive blue blur as the wheels turn. Both of these accessories are added just for Light Parades. Also it is important to note that the added LED lights fixed to the bike can only be used during parades as they will be deemed illegal lighting for normal road use and the Police may be upset enough to pull out their note books and start writing out charges !!! so don't do it.